On December 16th- Parker and Payton had their Christmas choir concert at church. Unfortunately- I had to work and missed it.... but Geoff took lots of pictures for me! And he told me she did great! The next day- Parker had her Christmas school play. Thankfully- I had this day off! I really did not want to miss her first ever school play! Parker's K4 class all dressed up as the barn animals in the manger. And Parker was a dove. A cute little dove. And maybe it's just the hormones...but I wanted to tear up a few times during the program just because I love that Parker is taught the Word at school. 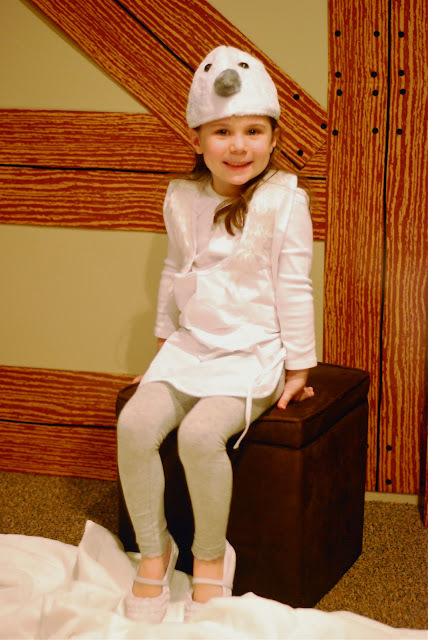 That her Christmas school play wasn't just about giving...but the real reason for the season. The rest of the stage. :) They had a dress rehearsal the morning of the program at school and when we got home that afternoon...Parker told me that she wanted to be an angel instead of a dove. Haha! I thought it was kinda funny, but made sense because she hadn't seen the other kids and their costumes before that day.